•3T9071335A x 2 - For vehicles with partition system. For Octavia, extra securing strap (3T9071335A) is required. 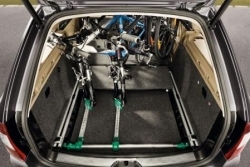 Product Details: The Internal Bike Carrier allows you to secure up to two bikes in the luggage area of the your Škoda for safe and secure transportation. It is necessary to remove the front wheel of each bike which is then secured alongside the bike.